Recipe 95: I like to cook but i love to make cakes… it makes me happy, so last saturday, quite late in the night i decided to prepare a nice cake for the sunday breakfast. 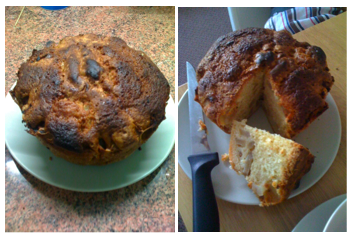 So i take back one of my oldest recipe and i made this quick pear cake. Ingredients: 4 or 5 pears (depending by the size but if you prefer you can also use apples and the cake will be amazing anyway), 200gr sugar, 200gr flour, 3 eggs, 100gr butter (in origin the recipe was with 200 but 100 gr i think is enough) and a spoon of baking powder. Put in a container the sugar and the 3 whole eggs. Mix until it become a nice yellow color and put the butter in a sauce pan on a low fire to melt it. Let it cold down and then add it to the mix. Add slowly the flour and the baking powder and mix until you homogeneous. At this point you can put some butter and flour in a baking pan or simply a piece of baking paper like i did and you can pour the mix. Clean the pears and cut them in little pieces. Put them on the surface of the cake until full. Then put the cake in the oven at 180 degree for half an hour and for other 10 minutes at 140. As you can see the recipe is very quick and easy… but the result it’s really nice! PS. Mamy te la ricordi questa torta? la facevo sempre con le mele, ma questa volta ho deciso di provare con le pere. Qui normalmente sono belle toste, percio’ ho pensato che almeno nella torta me le sarei potute gustare un po’ piu’ morbide. Che te ne pare? non male no? Questa ricetta non mi delude mai!